Keeps me in the Word! I love this app! I have it on all of my devices. It syncs, so I don't lose my place. I love that I can add many translations and enjoy them all in one place. The reason I give it 4 out of 5 stars is because the settings are sometimes a little quirky for me, but it doesn't impact the functionality. Overall, it's a great app with many great features. It keeps me in the Word daily! I loooove the message Bible and how it brings scripture to Life n better understanding of the Words, in story form, holding your attention!! Have keep working to understand the logic on the mechanics of the software..once you get over that hump, it works very well. I love the message bible: it’s right in your face, real word, the reading of the word of God in this book is just like having a real conversation with a friend that want sugar coat the truth to you. As I strive to learn more of His love, I find that this app helps in many ways about enhancing my spiriuality. Thank you for your ministry. Best bible app out there. Completely worth the money. 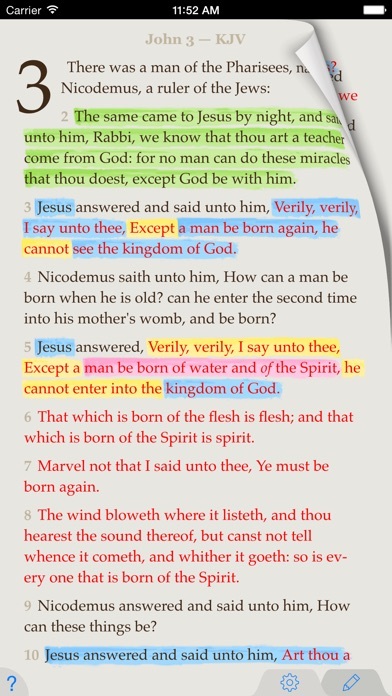 I first downloaded the free KJV Bible app from Tecarta, and I absolutely love it. But wanted the Message version to compare notes with, so when I saw that Tecarta made this app I bought it. And I hardly ever buy apps. It has a super easy design. Great navigation, very easy to highlight, take notes, share. ect. I've been using this program for a couple of years now and it fits my needs. It's very user friendly and you can take notes flip between scriptures and lots of features. I highly recommend this apt. Very disappointed deleted right money wasted way too casual for me. Wouldn't rate!! I enjoy this app very much. 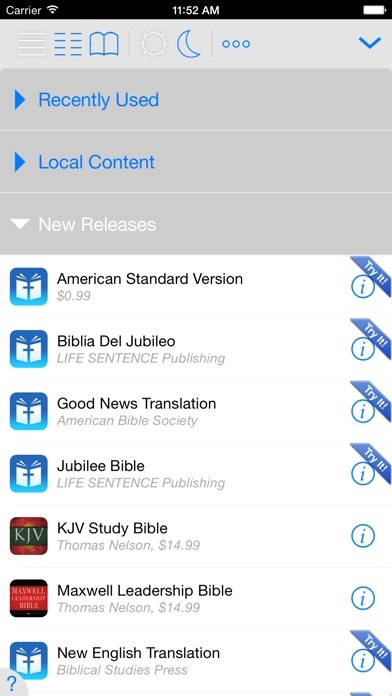 I use it in conjunction with the KJV and NIV versions I also have on my Ipad. Comparing the versions is helpful. I am very please with how user friendly it is. Everything about it makes my studying time come alive and gives me a clear understanding of Gods Word. Easy to navigate. Solid. Translation is unique to anything I've used before. Will be good to use in Bible study groups together with commentaries & study guides. Will recommend to others. This view is good for people who want more clarification. Easy to use and complete with all needed for bible studying. Love this APP - totally helpful and short learning curve. Great job with this little APP. Enjoy reading the Message. The app helps. Easy to use and does not distract from the Word. 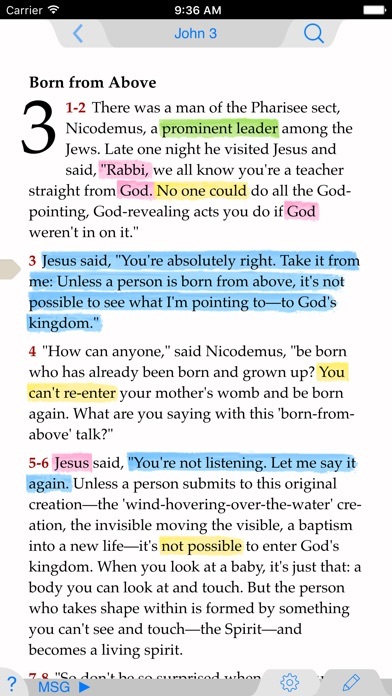 This is the first time I have read the message Bible and enjoying it. So easy to look up; easy to use, even for someone old like me who is lame at anything technical. Just love it. I love this Bible. Easy to navigate and use. The Lord lead me to this version as well and it's great! I recommend! It's so...refreshing! I need this perspective. Hearing Truth in language that is current and relevant helps me to assimilate the instruction communicated. This is a wonderful app that has allowed me the opportunity to read scripture with better understanding. I find the search very easy to use and since the updates, I've taken more notes. I also enjoy the parallel of the MESSAGE to the other versions to get a better understanding but not losing the content . Great app! This is the best for understanding the Bible in today's communication! I keep the new living or message translation open one side of the screen and strongs concordance KJV open on the other side. I love being able to read and look up words as I go. The highlighting and note adding functions are fantastic. I've been using it for years and never find myself "wishing it did something else". And I go through apps all the time. I really enjoy the convenience of having God's Word at my fingertips. I recommend this app highly because of the scrolling and ease of use. Super Bible! Even a small child can now read and understand the infallible word of God. Awesome! I find using this electronic bible convenient since I usually take my iPad everywhere I go. I can usually refer back to my notes, until the last update occurred. The only notes I can locate are from 2011. I believe They are there, however I cannot find them. I get frustrated because in church the notes I am working on get lost and I have to start over because I cannot locate the ones I started. Can I get some assistance? Either I need help in navigating the app or this app isn't very user friendly. I do like the feature of copying the scriptures in my notes. This makes the notes more efficient. Please, please fix this app so the search feature works! And add a table of contents. It takes so many steps to get to a verse. I cannot begin to express how blessed I feel to have found this app! I can organize my highlighted verses, make "margin" notes, I have even used it as a bit of a prayer journal. I just can't say enough good things. Without hesitation, I would recommend this app to EVERYONE! God bless you! It’s reading the Bible in a whole new way. Easier to understand. I appreciate the way this app functions and how it lets you read (compare) two versions simultaneously. It's got a simplified, pared-down interface and it works well. Hasn't ever crashed, in other words. Worth it! Easy to read, love how versus can be shared. Love it! Every morning I read the Verse of the Day and find it almost always JUST what I needed to hear. Then I proceed to read a chapter of the Bible and pray. This app has made me Quiet Times with the Lord so easy. Thank you for creating an app that has so highly impacted my walk with the Lord! This is a great way to study and apply the Word of God! I love the way this app allows you to immediately cross reference the text and then take you back to the original verse you are reading. The Bible tools are very organized and extremely user-friendly. I am so glad I spent the money on this bible! It makes reading the Bible like reading a story. I was raised on the KJV of the Bible but have read and understand and been fascinated by this version. Easy to highlight, easy to find a verse, and love having the Bible read to me! Thank you for a bible that I can understand. Love this app easy to use. And very helpful! This bible was prescribed for use by my pastor who is the shepherd that God has chosen his sheep to follow. And I am enjoying it very much especially the audio part because, it helps me when I have difficulty pronouncing some of the names in the Bible. I rate this bible with a 5 star rating. This Bible is Freckin Awesome! I read different versions from different authors different writers. this one is very comfortable for me to read. I love the translation and easy way to use it. This red letter Bible App is fun to use. It is very easy to move around between chapters. It even has a dozen resources (Max Lucado) to help you understand what you are reading. If other chapters are referenced in the resource, there are shortcuts to zip you right there for in-depth reading. Nice! Best Bible app I've used. This is by far the best Bible app I've used. The Message audio is particularly awesome. My mind does not have to change into 'Bible-Church-mode' to listen, comprehend and apply the scripture as I listen and comprehend. The language of scripture can cause we Christians to come across as having a Church persona and a day to day life persona. The language of The Message merges both worlds into one. Love it!!! I've had this app for a while and I'm blown away by how Gods word comes to life. A great tool and gift as you seek to know God and HIS will more and more. Just as it was critical to bring the Bible to the people in their specific spoken language from Latin so is it needed to update translations based upon contemporary sentence structure and vocabulary. The Message Bible makes this bridge beautifully. The app is relatively easy to use - read entire sections or search for particular verses and to take notes. I love the message bible app. I use it in conjunction with the amplified and new king James to expound when I study. It works well, love the fact you can take notes in it and highlight scripture that stands out! Simply thank god for it , another source to carry the gospel to the world ! 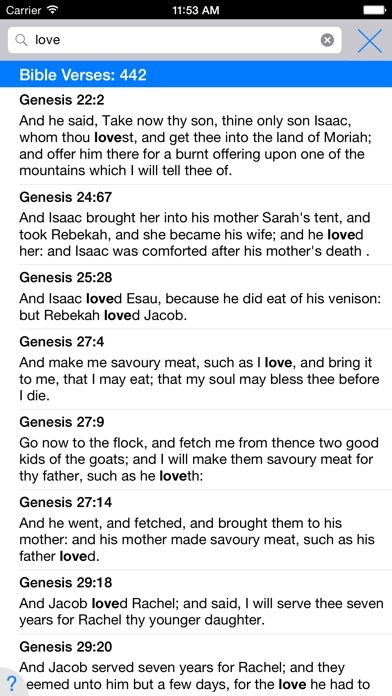 Love this Bible translation and the features in it. The Bible search tool is so easy to use. And I enjoy the daily devotional and verse of the day very much. This app is so easy to use! I can easily make notes, find definitions, and find the book/chapter/verse. It's great to take to church or have at my bedside for bible study. Best Bible app I have found. This is my go to version of the Bible when I need help understanding Scriptures. It's refreshing and uses modern day language to help me know what God is saying. I'm also liking the new scriptures for the day and the pictures that go with it! I really enjoy this version of the Bible. It helps to clarify the meaning behind scriptures that, written in old English, could be lost to the reader. I had long forgotten I had this app on my iPad. Recently, I had pulled my IPad out to begin using again, and the daily verses began popping up and daily they seemed to be meeting me in a way that only God could have orchestrated. The best Bible app period!!! The best Bible app that I have found. Great features, easy to use. I really like this translation. It is written simply, and is easy to understand. I love the highlight and memo features! I love the beautiful colorful pictures that go with the daily verse of the day!!!!!! The Message bible app allows the Word of God to be at your fingertips. It is awesome app that makes the Word accessible where I go. With this app, the Word could be carried in my pocket as I study to store it in my heart. 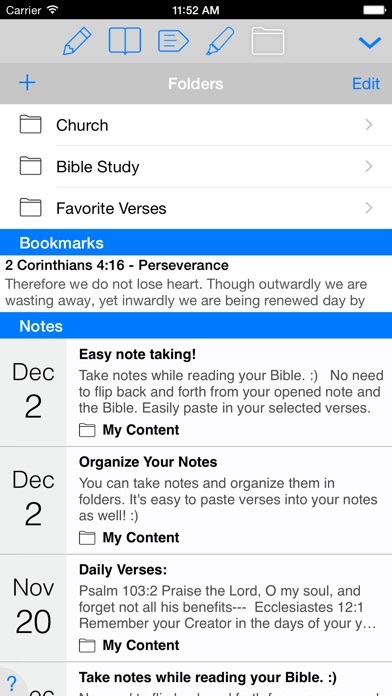 Love the Message app and all the additional devotionals that could be layered with an electronic bible. I really love this app. I can easily move around from verse to verse and I can leave notes attached to any verse. I can highlight in any number of colors and can text verses to friends. The app sends me meaningful verses everyday. The more I use it the more tools I find. Just an amazing wonderful app. Loving the Message translation. As for the app I have yet to find any glitches. Very user friendly. Quick and easy to get around on. A wonderful bargain for the price.I would like to be able to highlight a smaller section verses. Other than that very pleased. The Message is my favorite rendering of God's word & the app is user-friendly and a delight! I use it practically every day & I've just discovered the daily encouraging verse, which is helpful in my walk with the Lord. I love the side by side with King James and Message. It's simple. What a great additional tool to use alongside my Bible as I study God's Word. Thank you for this comversational translation!